Fishing is a new place is always really exciting. It’s fun to spend time learning about where to find fish and what to use to get them to bite. Nevertheless, if you only plan on spending a day or two fishing in a specific place, you might not have the time to learn all about the local fishing culture and where to catch the biggest fish. That’s where a fishing guide can help you. Take a look at some of the best reasons to fish with a guide. A guide can lead you to where the fish are. If you try fishing without a guide, you might get lucky and stumble upon a spot where all of the fish are biting. However, if you don’t, you will feel like you missed out on a great experience. Rather than trying to go at it alone, swallow your pride and let a guide show you the ropes. You will have just as much fun as if you discovered the great fishing spot on your own and you won’t have to worry about sitting around wondering where all the bites are. Your guide will make your fishing trip fun for you. A guide can provide you with the gear you need. When you use a guide for a fishing trip, you usually don’t have to worry about bringing your own gear. Of course, you can do it if you want, but guides typically have all the gear you need right on their boats. Moreover, many times, it’s good quality gear that they can provide you with. This will take one more thing off your plate and allow you to kick back and enjoy fishing rather than carrying your gear all over the place. A guide can show you new fishing techniques. 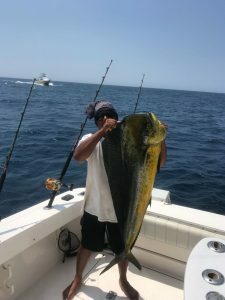 At Cabo Excursions, we want all of the anglers who come to us for guides to enjoy themselves when they hit the water. Our guides will make sure you have a great time fishing with us and will send you home with stories for days. Call us at 518-488-8275 today to book a fishing trip with a guide.